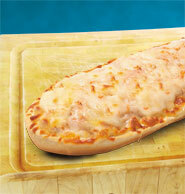 French bread topped with pizza sauce and 100% mozzarella cheese. 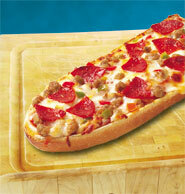 French bread topped with pizza sauce, sausage, mozzarella, pepperoni, green and red peppers, and onions. 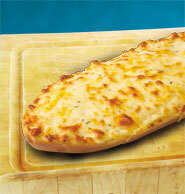 French bread topped with garlic spread, mozzarella, provolone, white cheddar, yellow cheddar, Romano cheeses, and parsley. 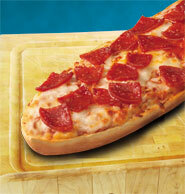 French bread topped with pizza sauce, mozzarella, and pepperoni. 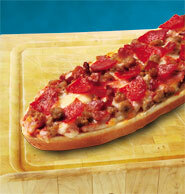 French bread topped with pizza sauce, sausage, mozzarella, pepperoni, and bacon. Click on any image to view product details. Please fill out this short form to find a fundraising dealer near you.